One of the things that excited me about coming to the Phillips for the year was the opportunity to be in a museum setting again, to have art objects near by and all around. Knowing that my fellowship was a research and teaching opportunity, however, I did not expect to get first-hand experience working with the collection. 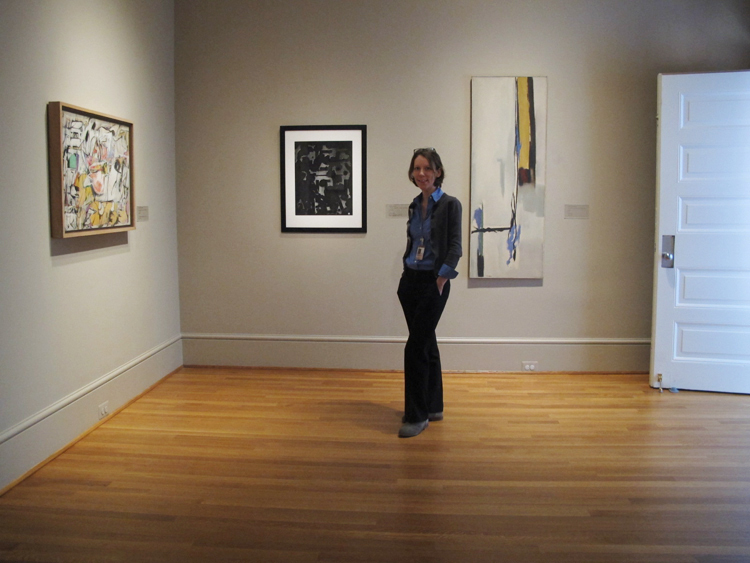 I tentatively suggested the possibility of installing a few abstract expressionist works in a gallery, and the curators and staff were more than enthusiastic and supportive. 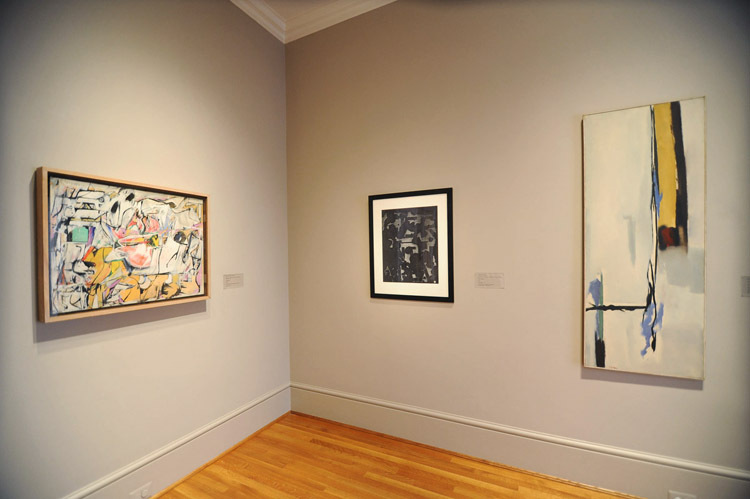 Fortuitously, the small hang coincides with the newly opened exhibition Angels, Demons, and Savages: Pollock, Ossorio, Dubuffet and shows how other artists in Pollock’s and Ossorio’s circle explored process and materiality as well as engaged themes of nature, landscape, and even spirituality. What I found challenging and exciting about this small project is that many of the works I had hoped to choose were unavailable, but my disappointment was quickly mitigated by how well the group of paintings selected in the end works together. Seeing the affinities between Tomlin and Ippolito, Kline and Stamos, Siskind and de Kooning, is very exciting. Duncan Phillips felt that paintings could talk to each other and different pairings could teach us something new and unexpected. 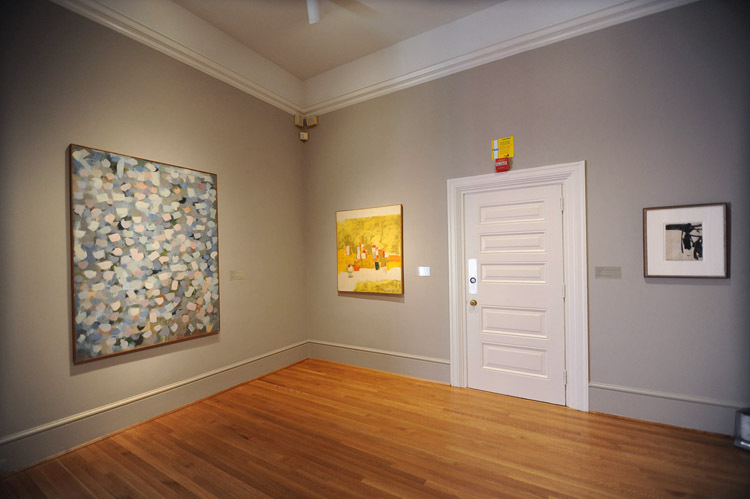 While it makes sense from a historical and social perspective to have these paintings in the same room, seeing the various combinations and affinities has made me look at the works in a new light. My scholarship tends toward intellectual and cultural history, and it is refreshing and important to be brought back to the physical works of art as I dive into writing my book manuscript. This entry was posted in Experiment Station and tagged Abstract Expressionism, permanent collection, postdoctoral fellows. Bookmark the permalink.